Become a "Platinum or Gold Sponsor"
The Los Angeles area has been occupied by human settlements since at least 3,000 B.C. Later inhabitants, who spoke a Uto-Aztecan language called Tongva, called the Los Angeles region "Yaa". When the Spaniard arrived in the 18th century A.D., there were 250,000 to 300,000 native people in California and 5,000 in the Los Angeles basin. Since contact with Europeans, the people in what became Los Angeles were known as Gabrielinos and Fernandeños, after the missions associated with them; their territory extended throughtout the Los Angeles and San Gabriel rivers and the southern Channel Islands, including the Santa Barbara, San Clemente, Santa Catalina, and San Nicholas Islands. The lives of the Gabrielinos were governed by a set of religious and cultural practices that included belief in creative supernatural forces. They worshipped a creator god, Chinigchinix, and a female virgin god, Chukit. The survival and success of Los Angeles would depend greatly on the presence of a nearby and prosperous Gabrielino village called Yaanga; its residents would provide the colonists with seafood, fish, bowls, pelts, and baskets. In 1542 the first Europeans to visit the Los Angeles region were Captain Juan Rodriguez Cabrillo and his crew. They were sailing up the coast looking for a new passage to Asia. In 1602, Captain Sebastián Vizcaíno dropped anchor at Santa Catalina Island and near San Pedro. It would be another 166 years before another European would visit the region. In 1777 new Governor of California, Felipe de Neve, decided to establish civic pueblos for the support of the military presidios. The new pueblos would reduce the secular power of the missions by reducing the dependency of the military on them. At the same time, they would promote the development of industry and agriculture. Neve identified Santa Barbara, San Jose, and Los Angeles as sites for his new pueblos. The official date for the founding of the city is September 4, 1781. The original name of the settlement is debated. According to D. P. Nunis, the Spanish named it "El Pueblo de la Reyna de los Angeles" ("The Town of the Queen of the Angels"), as it appears on a map dated 1785; however, F. Weber, reports that the founders called it "El Pueblo de Nuestra Señora de los Angeles de Porciuncula", or "the town of Our Lady of the Angels of Porciuncula". Later history and development of the city was at the center of many very relevant historical events, including the Mexican American War, the gold rush, and the many fights for civil rights related to the coexistence of several ethnicities, including native americans, chinese, latin americans and afro americans. Hollywood attracts millions of visitors each year who travel there to pay homage to their favorite stars and perhaps even catch a glimpse of a few famous personalities. Sometimes they're lucky! On these pages you'll find famous Hollywood landmarks such as the Walk of Fame (stars on the sidewalk), the Hollywood Sign, the Hollywood Bowl and more. There are links to the Hollywood tourist sites such as the landmarks, as well as new attractions like Hollywood & Highland entertainment center and Madame Tussaud's showcase of celebrities. 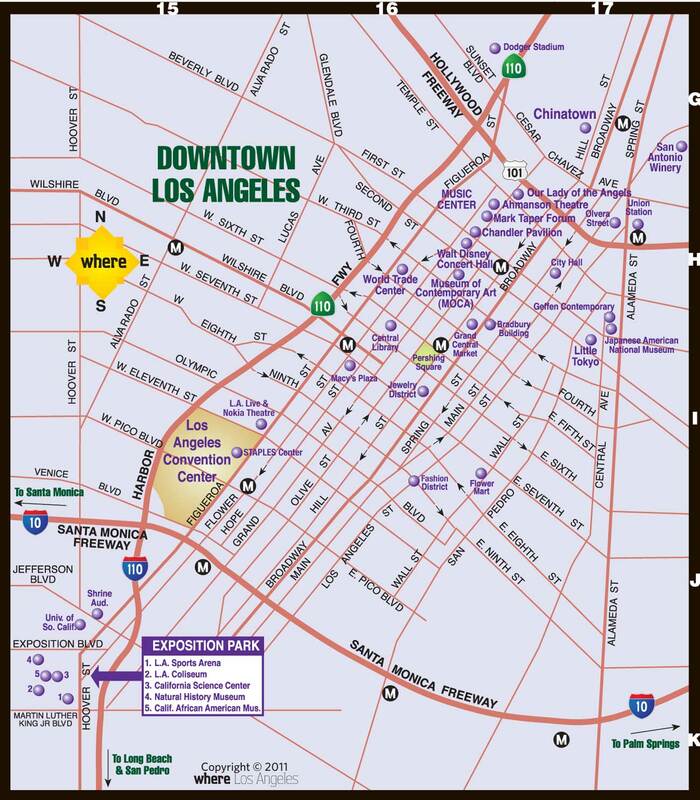 Los Angeles-area Shopping Centers and Malls - Los Angeles is a world-class premium shopping destination. Not only do we have a variety of stores to suit every taste and budget; we also have several different types of shopping venues. Here's a comprehensive and up-to-date list of LA-area malls, shopping districts (such as the Grove and Third Street Promenade) and open-air markets, organized by location. It includes factory outlets and farmers markets. Beverly Hills / Two Rodeo Drive - Beverly Hills is said to form a "Platinum Triangle" with adjacent neighborhoods Bel Air and Holmby Hills, as all three areas are regarded as the most affluent within Los Angeles. Beverly Hills is where you'll find perhaps one of most well-known streets in the world: Rodeo Drive - a haven for anyone who has a passion for fashion. As seen in Pretty Woman, these short three blocks are concentrated with an overwhelming array of designer labels, including the likes of Giorgio Armani, Bulgari, Cartier, Christian Dior, Dolce & Gabanna, Escada, Gucci, Harry Winston, Louis Vuitton, Prada, Valentino, Yves Saint-Laurent and more. Santa Monica / Venice Beach - Where can you go to experience the excitement of Southern California, the lure of the big city, and the peacefulness of a trip to the seashore - all in one visit? The answer is Santa Monica, the Los Angeles area's true "urban" beach. Enjoy ocean views, dining on the Pier, carnival games and rides at Pacific Park. Browse shops and watch street performers at the Third Street Promenade shopping district and Santa Monica Place shopping mall. Malibu - Attractions in Malibu including oceanside restaurants, museums, beaches, wineries that have tasting rooms and more. Disneyland and Disneyland's California Adventure. Disneyland - Southern California's most popular amusement park, with 14.5 million visitors in attendance during 2005. In the same year, Disneyland's sister park, California Adventure, drew 5.8 million visitors. Disneyland is a "must see" attraction. Universal Studios Hollywood - LA's second most popular theme park behind Disneyland/California Adventure. The world-famous movie studio and theme park featuring movie studios, tours, attractions, rides, restaurants and more. Get a behind-the-scenes look at special effects techniques. See what life's like on a movie back lot. Universal Studios is a another "must see" attraction, because it's a movie studio tour and a world-class amusement park all rolled into one package. Knott's Berry Farm covers 160 acres in Buena Park, CA, just 20 miles from Los Angeles. The park is consistently ranked among the top 15 theme parks in the country and continues to maintain its popularity. This is a good place for kids. The park and the shopping district follow an old western (cowboy) theme, plus features Snoopy and other Peanuts characters. December is one of the coolest months in Los Angeles and is also (relatively) very wet. The average daily temperature is between 19°C (66°F) and 8°C (46°F), with an average daily sunshine of about 8 hours a day. The average sea temperature is 15°C (59°F), so swimming can be quite challenging. The average rainfall during December is 66mm across 6 days, so bringing a light jacket and an umbrella is advisable since there is a high chance of showers. Weather in Los Angeles during the winter months is fairly unpredictable and can switch quite rapidly, so it would definitely be best to plan ahead and check the local weather before heading out. Since December 25th is Christmas Day, a lot of festive events happen around Los Angeles during the whole month. The Griffith Park Light Festival is a mile long festival of beautifully lit displays. Features include a drive through tunnel of lights! It is advised that you dress warmly if visiting on foot in the evenings. There are numerous parades across Los Angeles, including Belmont Shore and Montrose, that have floats, music, and of course, a visit from Santa Claus himself! You can also ring in the New Year at the New Year's Carnival Flair, in which people from 21 Latin countries celebrate with live music, arts and crafts, and traditional food and drink.